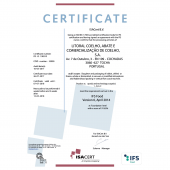 Food safety certification according to IFS Food V6 | Litoral Coelho - Abate e Comercialização de Coelho, S.A. The food safety certification according to IFS Food V6 was renewed for another year. We are grateful for the distinguished recognition and we have been grateful for the effort and dedication provided by our employees throughout the year.